the special right triangle called the 3-4-5 triangle. A 3-4-5 triangle is right triangle whose lengths are in the ratio of 3:4:5. When you are given the lengths of two sides of a right triangle, check the ratio of the lengths to see if it fits the 3:4:5 ratio. Find the length of the hypotenuse of a right triangle if the lengths of the other two sides are 6 inches and 8 inches. Step 1: Test the ratio of the lengths to see if it fits the 3n : 4n : 5n ratio. 6 : 8 : ? = 3(2) : 4(2) : ? Step 2: Yes, it is a 3-4-5 triangle for n = 2. Answer: The length of the hypotenuse is 10 inches. Find the length of one side of a right triangle if the length of the hypotenuse is 15 inches and the length of the other side is 12 inches. Answer: The length of the side is 9 inches. How to work out the unknown sides of right angles triangle? 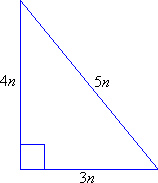 3-4-5 is an example of the Pythagorean Triple. It is usually written as (3, 4, 5). In general, a Pythagorean triple consists of three positive integers such that a2 + b2 = c2. Conversely, any triangle that has the Pythagorean Triples as the length of its sides would be a right triangle. Any group of 3 integer values that satisfies the equation a2 + b2 = c2 is called a Pythagorean Triple. Therefore, any triangle that has sides that form a Pythagorean Triple must be a right triangle. (3,4,5), (5,12,13), (7,24,25), (8,15,17), (9,40,41), (11,60,61), (12,35,37), (13,84,85), (16,63,65), (20,21,29), (28,45,53), (33,56,65), (36,77,85), (39,80,89), (48,55,73), (65,72,97).